Read any article or pamphlet on how to save energy at home and one of the top recommendations is to use outdoor line drying for laundry to save money, protect the earth, and even whiten white clothes. With just some clothesline, a few clothespins, and a couple of posts or trees; you're in business. We all have visions of spring breezes and crisp white sheets blowing in the breeze. Perhaps a clothesline brings back the nostalgia of Grandma and warm, lazy summers. But outdoor clothes drying is not always perfect. There are downsides. Take a look at these six reasons to keep your clean laundry inside. Many neighborhoods and some towns and municipalities have rules and regulations about outdoor clotheslines. To some, clotheslines are considered eyesores that lower and endanger property values. While some areas allow home clotheslines if they are hidden from the street, that doesn’t mean no one will complain about seeing your underwear flapping in the breeze. Another downside is that homeowner association or city fines can be costly! 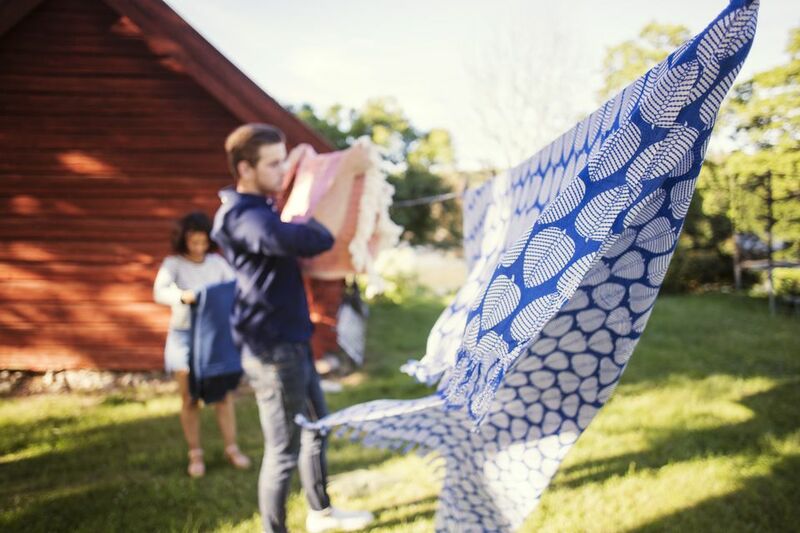 If you still want to have a spot to dry some items in the sun and fresh air, consider an indoor folding rack that can be easily placed outside but brought in as soon as the fabrics are dry. While there are many different designs for clotheslines, you must designate and reserve a specific space in your yard that is not under trees and receives plenty of direct sunlight. There must clearance space around the lines to move around freely for hanging and gathering clothes. With space sometimes at a premium, consider what type of support structure is best for you and how you use your yard. Retractable clotheslines may be a solution if you need the space for children to play or for entertaining when clothes are not hanging. Not everyone has a sweet-smelling meadow just outside their door. If your clothesline is in a less than desirable area, your clothes can absorb the odors of diesel fuel, animal farm odors or chemical and manufacturing plants. Line-dried clothing will also bring outdoor pollen and mold spores that are floating by outside into your home. These allergens can be very troublesome for those with compromised immune systems, asthma, and pollen sensitive allergies. You're not going to save energy if you must re-wash your laundry after a visit from the birds and bees outside. Bird droppings and insect specks require another trip through the washer. Some bird dropping stains are nearly impossible to remove especially if you have fruit vines or trees with red or purple fruit or berries nearby. Sunny, dry weather is ideal for line-drying unless it is so dry that dust is kicking up and staining your clothes. Even worse is a quick rain shower that can bring down leaves and debris that can stain clothes and require another washing. One good thing about a clothesline is that it will not shrink clothes like the excessively high heat of some dryer cycles can do. The ultraviolet rays of sunlight directed at a clothesline are also great for bleaching white linens and clothes so they look their whitest. But, if you have colored clothes, sunlight is one of the worst things that can cause fading. Your dark jeans won't be dark for long. You must also be careful with knitted stretchy clothes. The weight of being hung can make that knit shirt get longer and longer. Birds have even been known to pull some loose threads out from clothes to use for their nests. And you can't discount clothing thieves. The thieves may be after name-brand clothing but they may also be the four-legged variety that steals clothes. My mother lost her favorite lace tablecloth to a collie that had the best time pulling it through the yard. I can tell you that the utility costs she saved by line-drying did not pay for the new tablecloth. Not to mention the mental anguish that she bestowed on me and my dog! I'm an enthusiastic proponent of clotheslines and outdoor drying. But, I am also grateful to have an indoor automatic clothes dryer and the option of using it. Isn't life better when we have choices?